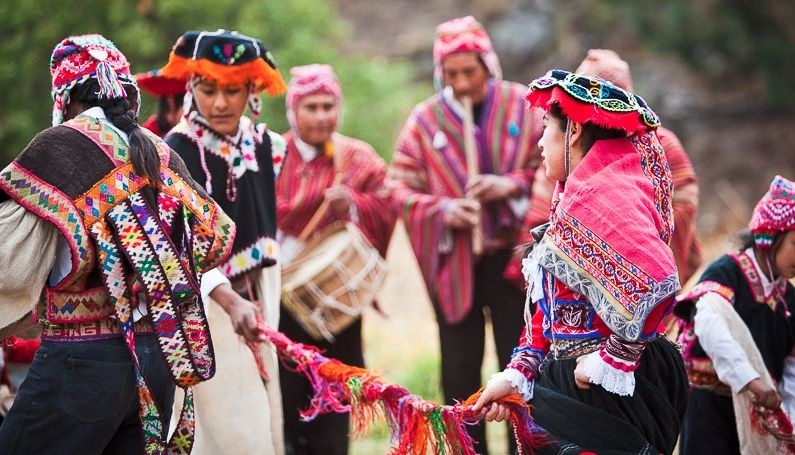 The Andean Legacy gatherings, celebrations and events take place in various parts of Peru. The Andean Legacy was instituted to honor the community’s traditional culture while standing up for their rights and self-direction in their own land and resources. This is the opportunity needed to protect both their culture and the sacred land and plants of the Apus. The Andean Legacy initiative is the foundation of the Kusi Kawsay Association and involves music, dance, art, weaving, and practicing environmental consciousness through agriculture and education to preserve and celebrate the indigenous Andean culture and identity. Students are in direct connection with the arts that gave birth to their culture, with the land that they care for and nurture while receiving intricate weaving skills that produce beautiful textiles. For the Andean culture, the earth is the most important relationship to nurture and reciprocate. The initiative seeks to protect and conserve the Andean cultural identity and the resources that are vital to the cultural survival. There are nine major annual events in the Andean calendar – all of which involve the observation of astronomy, the sharing of locally grown food and home made corn drinks, walking and dancing through the mountains in traditional clothing while using important elements and resources to practice the Andean philosophy “Ayni” or reciprocity. Preserving the Andean cultural identity goes hand in hand with preserving this fragile environment and landscape – one cannot exist with out the other; they are interdependent. Our long-term goal is to empower and equip a new generation of young indigenous Andean children and youth with the tools, music, dance and respect for the land that will allow them to sustain the Andean cultural identity and continue to pass these beautiful traditions along to future generations.